Are you trying to decide whether a passenger van is right for you? Well, our team at Affordable Rent-A-Car and Sales will give you five reasons why a passenger van rental may be the right fit. 1. You pack a lot of luggage. Do you tend to take quite a few suitcases, no matter where you go? Well, stop worrying about storage space when you rent a passenger van. There’s plenty of room for all your bags and you. 2. You’re traveling in a group. Group travel can be full of hassles and stressors. Whether you’re traveling with a sports team, church group, or band, you can enjoy the road trip a little more by renting a passenger van that’s built for group travel. 3. You have a large family. We love a good minivan as much as the next person, but when you have a large family, sometimes a minivan just won’t cut it. A passenger van rental can accommodate anywhere from 12 to 15 people, allowing you all the seat belts you need to transport your family safely. Even in the age of smartphones to keep you connected, traveling in a caravan of cars isn’t fun. Someone always ends up getting separated from the pack. Instead, rent a passenger van, and enjoy traveling together in one vehicle. 5. You need some more elbow room. Combine a bunch of luggage, travel pillows, devices, and passengers, and you’re going to quickly run out of space—and no one likes to travel in a cramped car. A passenger van, on the other hand, affords plenty of space so that you and your crew can travel comfortably and avoid that feeling of the walls closing in on you. To find out more about our passenger van rentals, contact Affordable Rent-A-Car and Sales today at (801) 266-7368. 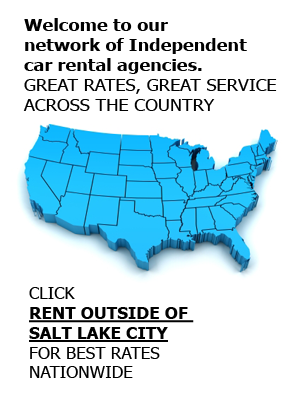 We are a locally owned and operated car rental company here in Salt Lake City offering you quality vehicles at affordable rates. We’d be glad to tell you all about our van rentals and quote you a rate. You can make a reservation on the phone or book online anytime.